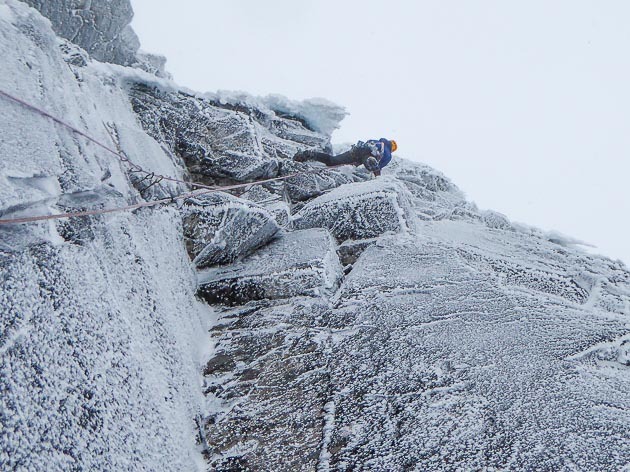 On February 10, Iain Small and Murdoch Jamieson climbed one of the most spectacular new routes of the season when they made the first ascent of Gates of Paradise (VIII,8) on Church Door Buttress on Stob Core nam Beith. “It lies further up the crag than any of the existing summer routes,” Iain explained. “In summer there seems to be a constant spring-fed weep down that section of the cliff, so in winter it forms a set of hanging icicles and a line that I guess has been eyed up a fair bit. When I was up there doing Crusade earlier this season the icicles were starting to form and I thought a return visit might be on if the freezing levels kept yo-yoing. The line had formed up into some ice-coated lower walls and slabs from the dripping icicle fringe, then a steep mixed section to roofs and through them to gain the icicles. Murdoch did a short pitch to an obvious ledge then I tackled the main pitch, which started off rather run-out up an icy arête – a weird position! – to protected grooves and a strenuous roof with a knee-bar rest on an icy tufa like feature. I’m not sure if Murdoch used this as he treats them with disdain on sports routes. A hard pull then gained the ice and some short screws after which it was all over. With it being short but intense, we thought VIII,8 might cover it, high in the grade, but with more ice the roof section would ease a bit. It’s hard to know what average conditions would be for the ice. This entry was posted in New Routes and tagged Iain Small, Murdoch Jamieson, Stob Coire nam Beith. Bookmark the permalink.